314 Commonwealth is located on the SW corner of Commonwealth and Hereford, with 40 Hereford to the east, across Hereford, 318 Commonwealth to the west, 311 Commonwealth to the north, across Commonwealth, and 45 Hereford to the south, across Alley 430. 314 Commonwealth was designed by architect Charles Brigham and built in 1899-1900 by Lyman D. Willcutt & Son, masons, as the home of Albert Cameron Burrage and his wife, Alice Hathaway (Haskell) Burrage. He is shown as the owner on the original building permit application, dated April 29, 1899. 314 Commonwealth was built on a 55.66 foot wide lot composed of a vacant lot at the corner of Commonwealth and Hereford with a frontage of 29.97 feet on Commonwealth, and the lot to the west with a frontage of 25.69 feet where an earlier townhouse at 316 Commonwealth had been located. Alice Burrage acquired both properties on January 17, 1899, from real estate dealer James Goldthwaite Freeman. James Freeman had acquired the corner lot that same day from Horatio Hollis Hunnewell, and the house and lot at 316 Commonwealth from Mayde Elizabeth (Manfull) Flower, the wife of Dr. Richard Charles Flower, three days earlier. Both lots had been part of a lot with a 90.25 foot frontage that ran between Commonwealth and Newbury, part of a parcel owned by Caleb H. Warner and Charles F. Smith, trustees for the benefit of the creditors of Nathan Matthews. That parcel was part of a larger tract of land Nathan Matthews had purchased on January 2, 1871, from David Sears, Jr., Frederick R. Sears, and Knyvet Sears. On April 1, 1879, Caleb Warner and Charles Smith sold the northern half of their lot, between the alley and Commonwealth: the corner lot with a 28 foot frontage to Sumner Mead and the lot to the west with a 62.25 foot frontage to Frank N. Thayer and William H. Lincoln. In the deeds, Caleb Warner and Charles Smith included language specifying that only dwelling houses facing Hereford could be built on the land they retained between the alley and Newbury. On October 23, 1879, Frank Thayer and William Lincoln acquired a 13.41 foot lot to the west from John Worster (the northeastern portion of an irregularly shaped lot with a 44.75 foot frontage on Commonwealth), and on November 21, 1879, Frank Thayer purchased Sumner Mead’s 28 foot corner lot to the east. On March 21, 1881, Frank Thayer and William Lincoln sold the western 48 feet of their land to building contractor John W. Shapleigh, who built 318-320 Commonwealth on it. On the same day, William Lincoln sold Frank Thayer his remaining interest in the land, resulting in Frank Thayer owning the 55.66 foot lot at 314-316 Commonwealth. He built 316 Commonwealth on the western 25.69 feet and left the remainder to the east vacant. Frank Thayer and his wife, Ella S. (Young) Thayer, lived at 325 Commonwealth. He was a ship’s chandler, ship broker, and shipping merchant. He died in April of 1882 while 316 Commonwealth was nearing completion, and Ella Thayer continued to live at 325 Commonwealth. His estate sold 316 Commonwealth to Richard Flower and the vacant land at the corner of Hereford to Franklin T. Rose. The corner lot at 314 Commonwealth subsequently changed hands and was acquired on August 10, 1889, by H. Hollis Hunnewell. 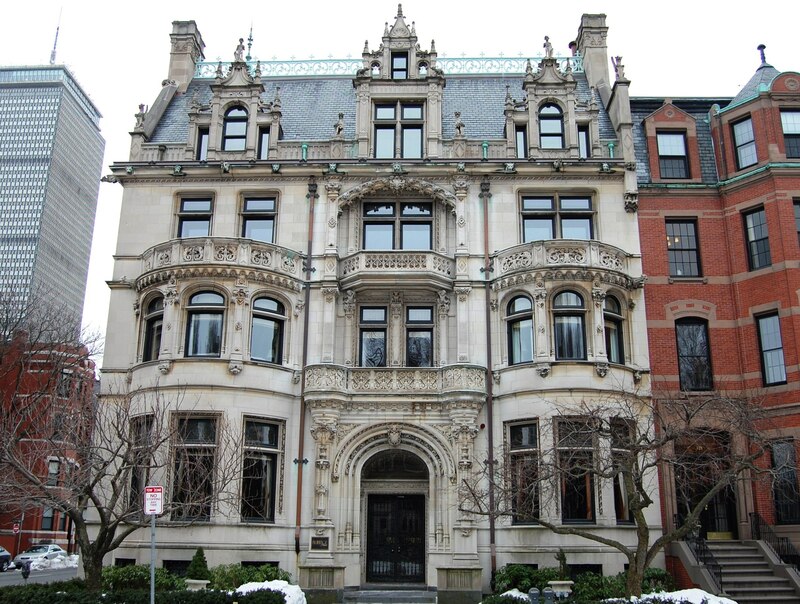 His son-in-law and daughter, Francis Williams Sargent and Jane Welles (Hunnewell) Sargent, had recently completed their home across the street, at 40 Hereford. When H. Hollis Hunnewell sold the lot to James Freeman in 1899, he included language for the benefit of the Sargents’ property specifying that, for the next twenty years, only a dwelling house could be built on the land at 314 Commonwealth and that the height of any house could not exceed four and one-half stories (and no more than 65 feet) and the depth could not exceed 85 feet (but allowing one story extensions further south to the alley). Click here for an index to the deeds for 314 Commonwealth, and click here for further information on the land on the south side of Commonwealth between Hereford and Massachusetts Avenue. .
After acquiring 314-316 Commonwealth, the Burrages had the house at 316 Commonwealth demolished and their new home constructed. It was completed by the 1900-1901 winter season. During the previous season, they had lived at the The Somerset, and before that at 140 Townsend. They also maintained a home in Cohasset, The Caravels. Albert Burrage was an attorney and former president of several local gas lighting companies. In 1898, became interested in copper mining and was one of the original organizers of the Amalgamated Copper Company, which later became the Chile Copper Company. He also was owner of several chemical companies through the Drugs and Dyestuffs Corporation of New York. Albert Burrage was an avid horticulturalist and 314 Commonwealth included a one-story glass conservatory at the rear of the house, extending to the alley. In 1901, the Burrages built a home, Monte Vista, in Redlands, California, also designed by Charles Brigham. In May of 1911, they sold their Cohasset home to Cyrus H. McCormick of Chicago (the May 20. 1911, Boston Globe article on the sale described it as “one of the most pretentious estates in that portion of the South Shore”). In 1921, the Burrages purchased an estate in Manchester, Massachusetts, designed by Little and Browne, which they called Seahome. They sold their Redlands home in 1926, but retained Seahome as their summer residence. Albert and Alice Burrage raised their four children at 314 Commonwealth: Albert Cameron Burrage, Jr., Francis Hathaway Burrage, Russell Burrage, and Elizabeth Alice Burrage. Albert C. Burrage, Jr., graduated from Harvard in 1908 and became a metallurgist in Bayonne, New Jersey. He subsequently returned to Boston to become a mining engineer affiliated with companies developed by his father; he lived at 314 Commonwealth with his parents. He married in April of 1915 to Anne Bell Shirk. After their marriage, they lived in Hamilton. They later lived at 29 Hereford and in Ipswich at Candlewood Farm. A horticulturalist like his father, in 1954 he published Burrage on Vegetables on the growing of vegetables. Francis Burrage graduated from Harvard in 1910 and became a banker. He married in September of 1911 to Marion Otis Gay. After their marriage, they lived in an apartment at 52 Hereford. He died three months later, in December of 1911. Russell Burrage graduated from Harvard in 1911 and joined a firm which manufactured ammunition casings. He married in April of 1912 to Katharine Lee Baxter. After their marriage, they lived in an apartment at 8 Gloucester. Elizabeth Burrage married in November of 1916 to department store heir Harold Leufroi Chalifoux. After their marriage, they lived at 269 Beacon and in Beverly. Albert Burrage died in June of 1931. 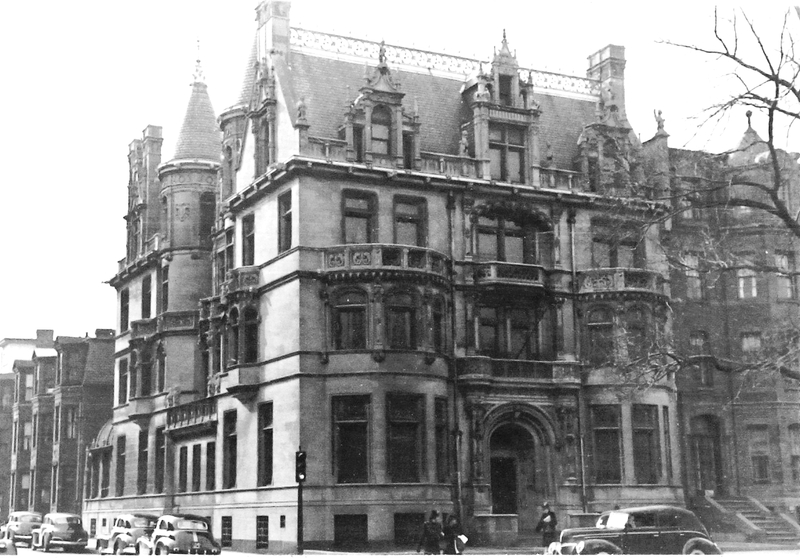 Alice Burrage continued to live at 314 Commonwealth and in Manchester until her death in December of 1947. In her will, she left Seahome to her daughter, Elizabeth Chalifoux, and also specified that she had the right to purchase 314 Commonwealth and property in Beverly for a specified price. On May 19, 1948, Elizabeth Chalifoux purchased 314 Commonwealth from her mother’s estate, and on May 24, 1948, she sold it to 314 Commonwealth Avenue, Inc., formed by real estate dealer Myron Widett. In July of 1948, the corporation filed for (and subsequently received) permission to convert the property from a single-family dwelling into twenty medical offices. On August 19, 1956, the Phoenix Mutual Life Insurance Company foreclosed on a mortgage given by 314 Commonwealth Avenue, Inc., and took possession of the property. On July 22, 1959, 314 Commonwealth was acquired from Phoenix Mutual Life Insurance by the Boston Evening Clinic and Hospital. It previously had been located at 397 Commonwealth. On October 20, 1990, 314 Commonwealth was purchased from the Boston Evening Medical Center, Inc. (formerly the Boston Evening Clinic and Hospital) by the Boston Back Bay Board & Care LP of Ocean View, New Jersey. In March of 1989, prior to finalizing the purchase, it applied for (and subsequently received) permission to convert the property into a nursing home and elder care facility, called Burrage House. In 1999, Boston Back Bay Board and Care declared bankruptcy, and on January 3, 2000, it transferred 314 Commonwealth to LB Burrage House, Inc., in compliance with its bankruptcy plan. On June 13, 2002, 314 Commonwealth was purchased from LB Burrage House, Inc., by Burrage House LLC (Scott W, Jenkins, manager). In October of 2002, ELV Associates (on behalf of Burrage House LLC) filed for (and subsequently received) permission to convert the property into five apartments with a garage. In conjunction with the conversion of the property, the entry vestibule, great hall, grand stairway, and second floor common hall were designated as landmarks to ensure their preservation. On November 18, 2003, Burrage House LLC converted the property into five condominium units: the Burrage Mansion Condominium. Below is a panoramic view of the corner of Commonwealth and Hereford ca. 1903, looking southwest, with 314 Commonwealth in the foreground; image by E. Chickering & Co., provided courtesy of the Library of Congress. 314 Commonwealth replaced an earlier townhouse at 316 Commonwealth designed by architect Obed F. Smith and built ca. 1881 for Frank N. Thayer, a ship’s chandler, ship broker, and shipping merchant. Frank Thayer and his wife, Ella S. (Young) Thayer, lived at 325 Commonwealth. As noted above, 316 Commonwealth was built on a portion of a 62.25 foot lot that Frank Thayer and William H. Lincoln purchased on April 1, 1879, from Caleb Warner and Charles Smith, trustees for the benefit of the creditors of Nathan Matthews. The lot was part of a larger tract of land Nathan Matthews had purchased on January 2, 1871, from David Sears, Jr., Frederick R. Sears, and Knyvet Sears. Frank Thayer acquired William Lincoln’s interest in the property on March 21, 1881, and construction of 316 Commonwealth started at about that time. 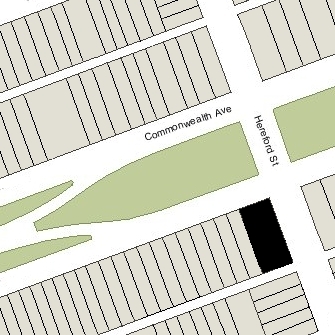 Frank Thayer also owned the lot to the east, at 314 Commonwealth, which he left vacant. Frank Thayer died in April of 1882 while 316 Commonwealth was nearing completion. Ella Thayer continued to live at 325 Commonwealth. On March 10, 1883, 316 Commonwealth was purchased from Frank Thayer’s estate by Dr. Richard Charles Flower. He and his wife, Mary Elizabeth (called Mayde) (Manfull) Flower, made it their home. They previously had lived at 2 East Brookline, where their daughter, Evangeline, was born in February of 1883. On November 10, 1884, he transferred the property into his wife’s name. Richard C. Flower had been a lawyer and later a minister in the Midwest. He then became a physician and practiced in New York and Philadelphia before coming to Boston in 1882. In Boston, he founded a patent medicine company, producing and marketing a number of proprietary remedies through the Flower Medical Company, including “Dr. R. C. Flower’s Liver and Stomach Sanative,” “Dr. R. C. Flower’s Nerve Pills,” “Dr. R. C. Flower’s Lung Cordial,” and “Dr. R. C. Flower’s Blood Purifier,” among others. Richard Flower’s brother and sister-in-law, Benjamin O. Flower and Hattie (Cloud) Flower, lived at 316 Commonwealth in 1884 and 1885. He was president of the Flower Medical Company and later became a magazine publisher and editor. By 1886, they had moved to 316 Newbury. 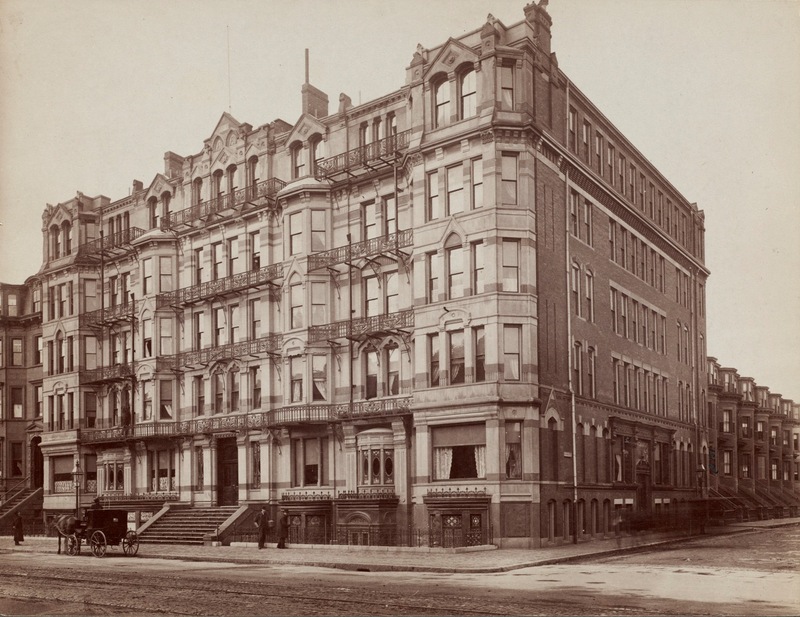 In 1889, Richard Flower opened the Hotel Flower on Columbus Avenue at Holyoke Street, described in Boston of To-Day as combining “the features of the home, hotel, and hospital without the disagreeable accompaniments of the latter.” The sanitarium was operated on an elaborate scale and news reports indicated that, in addition to more traditional cure, spiritualism, séances, and hypnotism were practiced. The Hotel Flower had not been a financial success and in March of 1890, he sold the property and it subsequently became the Grand Hotel. In addition to his medical business, Richard Flower was a promoter of various investments, including gold and silver mines, large land developments, and other projects. In 1893, he and Paschal R. Smith were accused of selling Nathaniel C. Foster, a lumber merchant of Fairchild, Wisconsin, fraudulent bonds in the Deming Land and Water Company. Dr. Flower fled Boston and was arrested in Texas in December of 1894. It is unclear whether he was ever convicted. On January 9, 1895, Malcolm McLoud foreclosed on a mortgage he held on 316 Commonwealth and sold the property to Ella C. (Kimball) Taylor, the wife of Horace Brigham Taylor, of Portland, Maine. On March 12, 1895, the house was acquired from her by Richard Flower’s sister, Elizabeth (Flower) Willis , the wife of Maurice C. Willis, and on the same day it was acquired back from her by Mayde Flower. Maurice and Elizabeth Willis lived at 316 Commonwealth with Richard and Mayde Flower at 316 Commonwealth in 1895. 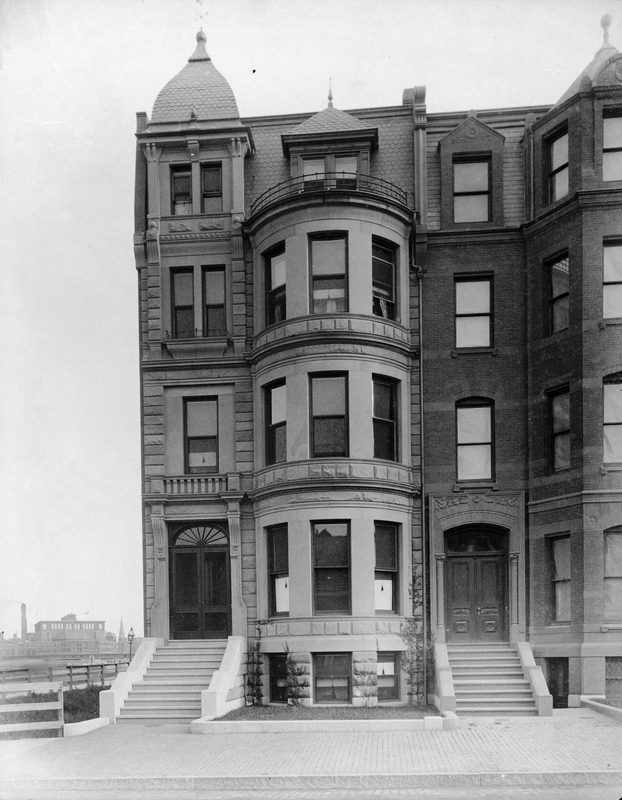 They previously had lived at 24 Rutland in Roxbury, resumed living there in 1896, but moved back to 316 Commonwealth to live with the Flowers by 1897. In the latter years of the 1890s, she organized “tableaux” entertainments in association with The Grecian Art Tableaux and Concert Company. In January of 1897, Richard Flower filed a petition in insolvency. The Flowers and the Willises continued to live at 316 Commonwealth until about 1898, but moved thereafter. On January 14, 1899, 316 Commonwealth was purchased from Mayde Flower by real estate dealer James Goldthwaite Freeman. Three days later, James Freeman purchased the vacant lot at 314 Commonwealth and sold both it and 316 Commonwealth to Alice Hathaway (Haskell) Burrage, the wife of Albert Cameron Burrage. They demolished 316 Commonwealth and built their home at 314 Commonwealth on the combined lots. By mid-1899, the Flowers had moved to New York City, where he formed R. C. Flower & Co., an investment banking firm with offices on Wall Street specializing in municipal bonds, mortgages, and western real estate and mining companies. In June of 1900, at the time of the US Census, Richard and Mayde Flower and Maurice and Elizabeth Willis were living at 242 W. 104th Street in New York City. Living with them were the Flowers’ daughter, Evangeline, and his son by his first marriage (to Ella (Nicholson) Flower), Jewell Flower, an attorney. He married in October of 1902 to Agnes McFarland. The Flowers moved to the Waldorf Hotel later in 1900. 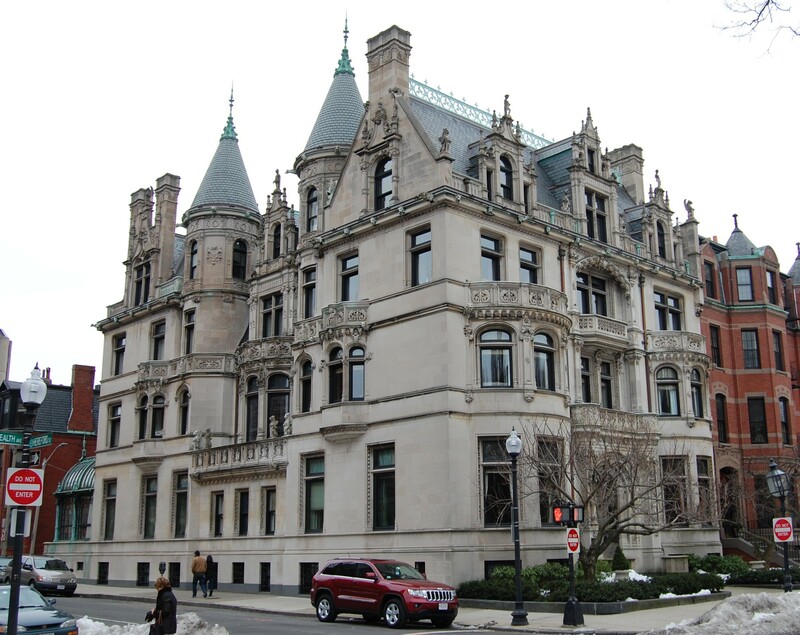 By 1904, the Willises were living in Worcester, where he became a real estate dealer and later a manufacturer of leather specialties, and she taught elocution, forming the Elizabeth Flower Willis School of Elocution, Oratory and Dramatic Art. She died in October of 1911. On January 14, 1901, the Baltimore Sun reported that investors in the Arizona, Eastern and Montana Smelting Ore Purchasing and Developing Company were alleging that R. C. Flower had misrepresented the dividend potential of the stock The story noted that, among those promoting the sale of the stock was R. C. Flower’s son (by his first marriage), Altus D. Flower. In 1903, the relatives of Theodore Hagaman, a millionaire who had died in 1900 while living at the Waldorf Hotel in New York City, brought suit to contest the distribution of his estate under his will. In the course of the proceedings, it was alleged that Mr. Hagaman had been poisoned. Both Dr. Flower, who was living at the Waldorf at the same time, and Mr. Hagaman’s widow, were implicated. An autopsy on the exhumed body showed no evidence of poisoning and no charges were brought. At about the same time, investors began filing complaints against Richard Flower alleging misrepresentation in his sale of mining company stock and he was indicted on five counts of fraud. Bail was provided by Mrs, Richard C. Storrs, one of the investors. In the course of the proceedings, George Edward Mills, law partner of Jewell Flower, was arrested for attempting to bribe a police officer and an assistant district attorney in connection with the case. Dr. Flower subsequently forfeited bail and disappeared. He was arrested in Philadelphia in January of 1907, where he was calling himself Dr. Oxford and promoting investments in a Persian gold brick manufacturing company. He was released on bail and again fled. News reports in September of 1908 indicated that Mrs. Hagaman was in contact with him and with his son, Altus Flower. In 1909, Mayde Flower sued Richard Flower for divorce, naming Mrs. Hagaman as the co-respondent. At the time of their divorce, his whereabouts were unknown. By 1910, Mayde Manfull (having resumed the use of her birth name) was living in Detroit with her son-in-law and daughter, George Goodwin Power and Evangeline (Flower) Power, who had married in August of 1908. Richard Flower was arrested again in 1913 and convicted in December of 1914 on charges of fraud. He was released from jail in August of 1915 and died in October of 1916 in Hoboken.